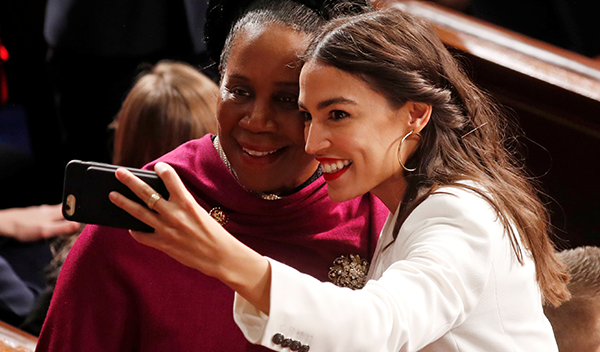 It’s fitting that the Green New Deal pushed by many but popularized by Democratic phenom Representative Alexandria Ocasio-Cortez, who had her “60 Minutes” debut on Sunday, is a triumph of recycling. Not of plastic bags or soda cans, but of ideas. Specifically, Franklin D. Roosevelt’s New Deal and the impulses behind it. To her credit, Ocasio-Cortez (D., N.Y.) is fairly honest about her ideological recycling. Ironically, the New Deal itself was largely about war mobilization — without war. Roosevelt campaigned for president promising to adapt Woodrow Wilson’s wartime industrial policies to fight the Great Depression. Nearly the entire structure of the New Deal was copied from Wilson’s “war socialism.” The National Recovery Administration was modeled on the War Industries Board. The Reconstruction Finance Corporation was an update of Wilson’s War Finance Corporation. The military buildup began not as a response to the Nazis but as a jobs program. The Public Works Administration paid for the aircraft carriers Yorktown and Enterprise, as well as four cruisers, many smaller warships, and more than 100 Army planes. Even the workforce was militarized. On Sept. 13, 1933, stores in New York were ordered to close to honor the president’s NRA Day Parade, then the largest parade in the city’s history. Nearly a quarter-million workers, organized by trade, marched past the president’s rostrum as 49 military planes flew overhead. I could go on, but the important point is that ever since philosopher William James coined the phrase the “moral equivalent of war,” American liberalism has been recycling the same basic idea: The country needs to be unified and organized as if we are at war, but not to fight a literal battle. The attraction stems from what John Dewey called “the social possibilities of war” — the ability to reorganize and unify society according to the schemes of planners and experts. This was the through line of 20th-century liberalism, and now 21st-century liberalism, too. Wilson’s war socialism, FDR’s New Deal, Harry Truman’s Fair Deal, John F. Kennedy’s New Frontier, Lyndon B. Johnson’s Great Society, Jimmy Carter’s declaration that the energy crisis was a “moral equivalent of war,” and Barack Obama’s “new foundation for growth,” with his Thomas Friedman-inspired talk about “Sputnik moments”: It’s all the same idea gussied up as something new. Instead, they name-check a thoroughly nationalistic enterprise, the New Deal, and slap the word “Green” in front of it as if it were a fresh coat of paint.